Here are the four scenarios that these two questions present, and considerations for all four. 1. Crop is past 30% seed colour change (SCC) on the main stem, plants have relatively few side branches, and heavy frost is forecast. This is not the ideal SCC for yield, but at 30% SCC, most of the seeds will be firm to roll. You may want cut this ahead of the frost to prevent locking in green on the most immature seeds. Note however that crop needs to dry down to a seed moisture level of 20% or less to be relatively safe from the damaging effects of frost. This can take three good drying days, so swathing has to occur at least three days before the frost to achieve this benefit. 2. Crop is past 30% SCC, green seeds are firm to roll, and light frost is forecast. 3. Crop is at 5% SCC and heavy frost is forecast. Many nights of frost. If frost is forecast for several nights in a row, canola with a high percentage of green immature seed might not have much chance to mature further. Growers could cut the crop and accept that any yield potential from immature seed is likely lost. Logistics and timing. 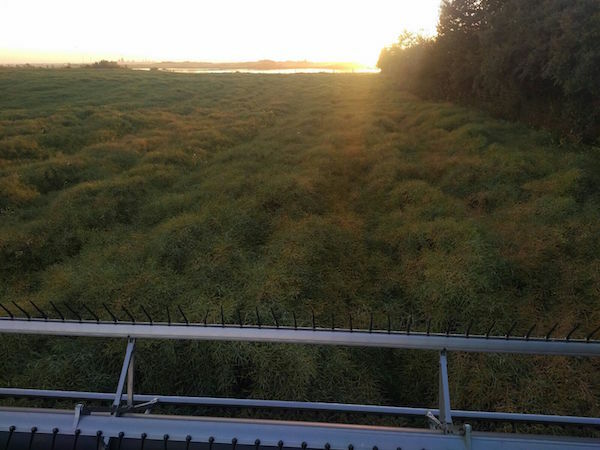 If growers still have a lot of canola to swath, they may need all the swathing days they can get. If today is a good day to swath, then go swathing but know that any yield potential from immature seed will likely be lost. Crop standing for straight combining. Frost can actually be a benefit as it provides some extra dry-down of green stems. Note, however, that frost at the point when pods are brittle and quite dried down will likely have little-no impact, and pod-shatter tolerance can also help maintain pod integrity if the crop wasn’t quite that dry yet.